Nampeera Lugira will become Principal of Cathedral High School on July 1, 2019. Nampeera, who received her bachelor’s and master’s degrees from Boston College. is a woman of Ugandan heritage who grew up in Winchester, MA. She started her educational career at Mt. Wachusett Community College as a resource specialist/data coordinator for underserved students. 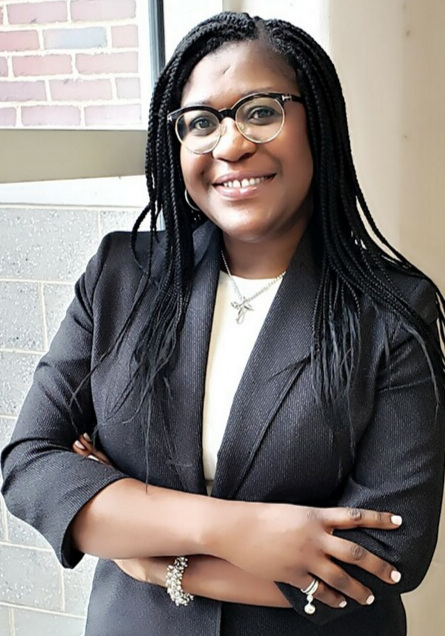 Nampeera went on to work within the Boston Public School System including serving as program Manager for BellXcel (formerly Building Educated Leaders for Life) and manager of the Office of Engagement. Most recently she was the Dean of Enrichment at the Codman Academy Public Charter School in Dorchester. Nampeera is an active member in Black Girls Run Boston, Africans in Boston and the BC Endeavor Alumni Program and Lead Boston YW. Head of School, Dr. John F. Dolan has an extensive background in strategic planning, enrollment management, and advancement, having worked at a variety of universities throughout the country since 1982. Dolan previously was vice president for enrollment management at Le Moyne College, a Jesuit institution, where he led a recruitment effort that resulted in the largest class in the college's history. Prior to Le Moyne, he served as senior associate vice president for university advancement at Drexel University; vice president for enrollment management at LaSalle University; and CEO of The Catholic Foundation in Denver. Dolan earned a bachelor’s degree in education from Benedictine College, a master’s from the University of Denver, and a doctorate from Drexel University. Associate Head of School, David Angeramo has spent the last 23 years at Salem High School, 12 as principal and 11 as a math teacher. He was the co-founder of College Prep Plus, a company assisting students with SAT preparation and the college application process. Angeramo earned a bachelor's degree in math from Dartmouth College, a master's in education from Salem State University and a certificate of completion from the Lynch Leadership Academy at Boston College. Kelly DeGregorio of Milton has been named as the new vice president of institutional advancement at Boston College High School. DeGregorio previously worked in healthcare philanthropy for 16 years, where she built comprehensive fundraising programs. Since 2013, she served as the assistant vice principal of major gifts at Brigham and Women’s Hospital, where she led gift initiatives for clinical and research programs, including cancer, women’s health and newborn medicine, as part of the hospital’s $1.5 billion campaign. A native of Massachusetts, DeGregorio has worked at Harvard Law School and the Martin Health Foundation in Stuart, Florida. Before that, she worked in marketing, communications and public relations. At BC High, DeGregorio will work with the school’s president, Grace Cotter Regan, and the board of trustees, as well as stakeholders and senior colleagues, in forging the school’s strategic direction. A graduate of Hamilton College in New York, DeGregorio lives in Milton with her husband and son. Michael O’Brien joins BC High as the Senior Director of Alumni Engagement after serving as Director of Admissions at Austin Prep in Reading, MA. Mike brings a wealth of programmatic development and strategic planning experience to BC High. In previous roles, Mike created programs for community service and outreach, international student recruitment, athletics and student affairs. At BC High, O’Brien will work with Vice President of Institutional Advancement, Kelly DeGregorio, to rollout an alumni engagement program that will offer affinity programs and a variety of volunteer opportunities for 15,000+ graduates of the school. A native of Connecticut, Mike graduated from The Gunnery School and Hobart and William Smith Colleges where he received academic and athletic honors. “Though technically a consultant, Mary Gene served as an integral part of our team during a time of tremendous growth.